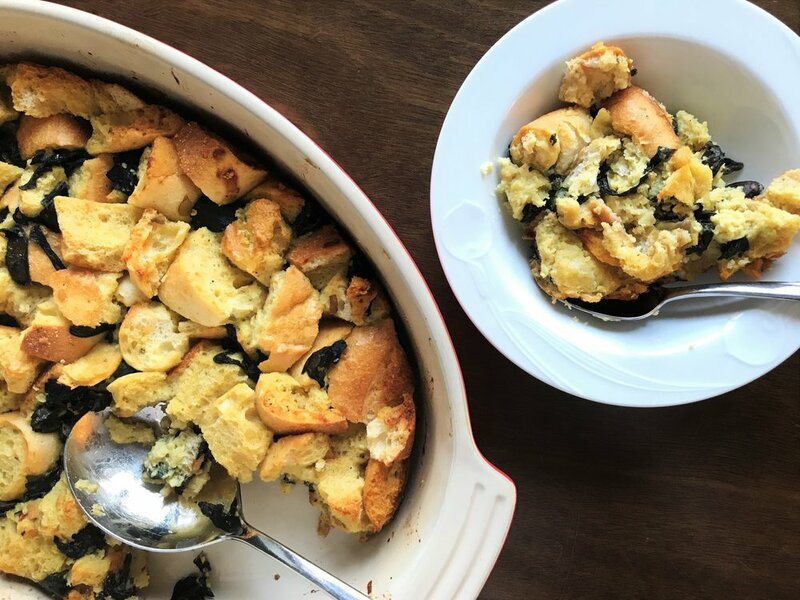 A savory bread pudding created to use up that stale baguette you have laying around, soaked in a parmesan custard with Swiss chard. Savory Chard and Parmesan Bread Pudding made in the Adventure Kitchen. 1. Break the hard, dry baguette into rough 1-inch pieces. The easiest way to do this is to first break it into large pieces with your hands, then put the large pieces in batches in a large zipper-style plastic bag and smash them up with a mallet or small skillet. 2. Grease a large ceramic or pyrex baking dish (see notes) with the butter. Whisk the eggs in a large bowl and add the milk, cheese and salt. Mix in the swiss chard, then add the bread pieces and stir to combine everything. Pour the mixture into the baking dish, cover and refrigerate for several hours or overnight. 3. When ready to bake, take the baking dish out of the refrigerator and preheat the oven to 350 degrees with the rack in the middle position. Use your hands to mix up and turn over the bread pudding pieces in the baking dish, so that the wetter bottom pieces are on top and the drier top pieces are on the bottom. When the oven is ready, slide the baking dish in and bake, uncovered, for 20 minutes. 4. Remove the baking dish from the oven and cover it loosely with foil. Return it to the oven and reduce the temperature to 325 degrees. Bake for another 35-45 minutes, until the pudding puffs up and sets. Serve hot or at room temperature. I created this recipe to solve a problem: what to do with that baguette you thought you would use for something, but didn't, and then it instantly became stale. This happens in my house all the time for some reason. With any other bakery loaf, it's different. If you don't get to it right away, no worries. It will certainly be fine the next day, or even the day after. But baguettes are slim, and housed in a paper bag rather than plastic, so they go stale in a hurry. This recipe was created to accommodate one standard-sized French baguette, so it requires a very large baking dish. I'm including a link to the exact baking dish I used to create the recipe (but mine's red). If your baking dish is smaller, you could use half a loaf and scale down the other ingredients accordingly. This brings me to another point: since this recipe was created to use stale (not fresh) bread, it calls for a lot of milk, and for soaking the mixture for several hours or overnight before baking. If you're using fresh bread, you could either cut it up and dry it out on a sheet pan in a low oven, or you could bake it right away with less milk (I'd recommend using 2 cups if this is the case). With fresh bread, I'd cut soaking time to around an hour. The recipe calls for stashing the baking dish in the fridge overnight, then sliding that cold dish right into the oven the following day. My Le Creuset ceramic dish handles this beautifully, and Pyrex would as well. They're made to withstand that kind of temperature change. But if you're using another kind of baking dish, there's a chance it could crack from the rapid temperature change. If you're concerned about this, you can let the dish come to room temperature before putting it in the oven.